Even the very young can appreciate the joy of high-detail imagery. This is why kids love seek-and-find books so much--with pages rich in visual detail, and little morsels of delight to seek out and crunch on as they flip page after page. 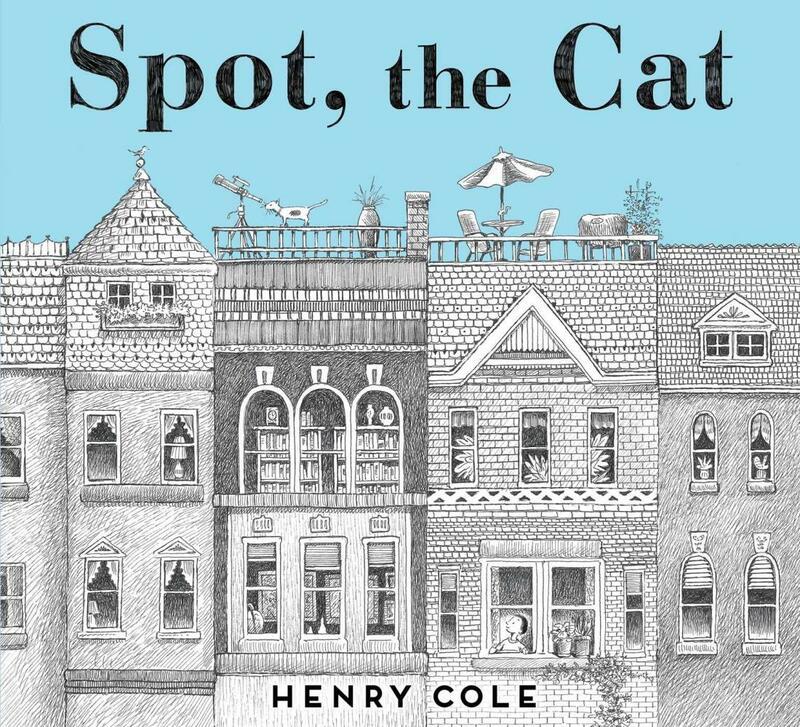 In Spot, the Cat, Henry Cole takes littlies on a double entendre journey, as they follow Spot, the cat, and his city meanderings ... while requiring them to simultaneously 'spot the cat' in a series of lush double page spreads. 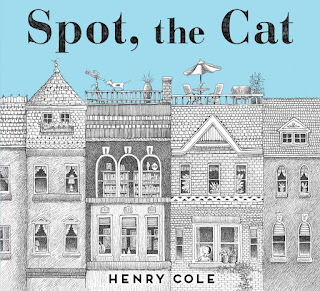 From the window of Spot's home, past the pharmacy, over the bridge, through the park and farmer's market, and all through town, we enjoy bustling scenes of detailed wonder, each time trailing the eye to find out where Spot has got to. Meanwhile, Spot's little boy owner is somewhat bereft to find his cat missing, and so puts up a Lost poster, pining for his return. But he need not worry. Cole's use of perspective in this book is striking. I particularly love the park scene, looking down to the kids below from the perspective of a kite. I love the smaller vignette pages that invite us to come a little closer, as our wee lad pines for his cat, and the full-blown street and town scenes that invite endless eye-meandering. Rendered in monochromatic cross-hatching this book will certainly enchant readers of any age. Its wordless story of friendship, adventure and hope will also enrich little minds.